Anti-riot police officers gather near the Cultural Center of the Philippines ahead of the Association of South East Asian Nations (ASEAN) Summit and related meetings in Manila, Nov. 11, 2017. Senior officials from 10 Southeast Asian countries, including some of the world’s fastest-growing, expect joint progress at summits in the Philippines this week on trade, investment and security with help from major world powers. But analysts say they are unlikely to get too far. Heads of state from members of the Association of Southeast Asian Nations (ASEAN) arrived one by one Sunday for a series of summits in Manila through Tuesday. They came to sign a free-trade agreement with Hong Kong and issue a proclamation on protecting migrant workers. Some will share tips at a forum Monday on how small enterprises can get money to vie with big ones. The leaders are widely expected to endorse efforts toward a denuclearized North Korea and peace in the South China Sea, where four ASEAN members dispute resource-rich tracts of water with Beijing. Separately they may consider a resolution against terrorism and extremism. But ASEAN member countries also resent each other over old historical issues — to wit Cambodia and Vietnam — while harboring suspicions of outside powers, some of whom will attend the 31st ASEAN Summit this week. Leaders from China, India, Japan, Russia, the United States and four other countries will join. 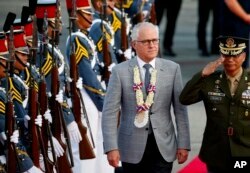 Australian Prime Minister Malcolm Turnbull, center, reviews the troops upon arrival at Clark International Airport in Clark, Pampanga province, north of Manila, Philippines, Nov. 12, 2017. China is already offering development aid around Southeast Asia to smooth trade, yet to avoid possible payback such as ceding natural resources or sovereignty to Beijing, those governments prefer a stronger U.S. role. They hope U.S. President Donald Trump gives them reassurances in Manila this week but expect no tangible breakthrough such as arms sales. Russia, which will send a delegation, is also considered disinterested due to relatively weak economic ties, while India is just getting started via economic cooperation with Vietnam. “Russia-ASEAN relations are likely to develop in a slow, incremental fashion over the next few years,” Chris Cheang, senior fellow with the S. Rajaratnam School of International Studies in Singapore, said on the school’s website. Southeast Asian countries are expected to seek favor particularly with Trump, who has made complimentary remarks to hosts around Asia on a tour since November 3. Playing to Trump's America-first ideals, Malaysia and Singapore announced plans earlier this year to buy aircraft from Boeing. To win more support in Washington, Southeast Asian leaders may voice support for Trump’s ambition to stop the development of missiles and nuclear weapons in North Korea, analysts say. But, they warn, Trump may not give much back, in keeping with his America-first principles. For example, Vietnam, an exporter nation with a U.S. large market, wants American help resisting Beijing in the South China Sea, as well as more trade liberalization with the U.S.. It also bitterly contests part of the sea with China, leading to periodic clashes since 1974. Vietnam's President Tran Dai Quang welcomes U.S. President Donald Trump with a state banquet at the International Convention Center in Hanoi, Nov. 11, 2017. 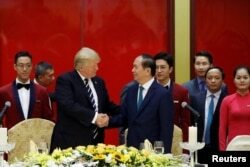 “I think that the Vietnamese government wants some assurance from President Trump that the U.S. will play a front role in maintaining the freedom of navigation in the South China Sea as well as some response to future assertive Chinese behavior,” said Trung Nguyen, international relations dean at Ho Chih Minh University of Social Sciences and Humanities, citing one example. But Southeast Asian leaders may play down the South China Sea dispute to get along with China, experts believe. Summit host the Philippines set aside its maritime sovereignty contests last year to build friendship with Beijing, which in turn pledged aid and investment worth $24 billion. Brunei, Malaysia and Indonesia have their own tight economic relations with China despite territorial disagreements. At the ASEAN Business and Investment Summit Monday, officials will discuss ways that smaller firms in Southeast Asia can find capital to vie with the region’s dominant large corporations. But that effort could grow tense as Southeast Asian countries compete with one another for investments, said Joey Concepcion, ASEAN Business Advisory Council Chair. Outside donors such as Japan and China use aid to vie with each other for favors in Southeast Asia. Summit organizers declined to say what non-ASEAN countries might offer at the event. The 50-year-old association encompassing 630 million people prides itself on overcoming disputes among members by reaching all-inclusive agreements on free trade and immigration. Those liberalizations have helped countries such as Cambodia and the Philippines grow economically at more than six percent a year.